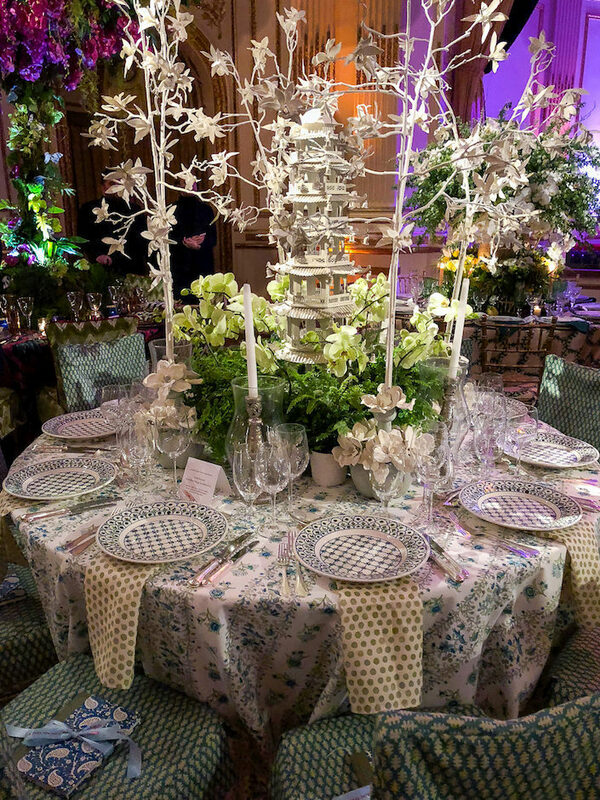 Today we continue our look at more of the beautiful tables from the 2018 NYBG Orchid Dinner. 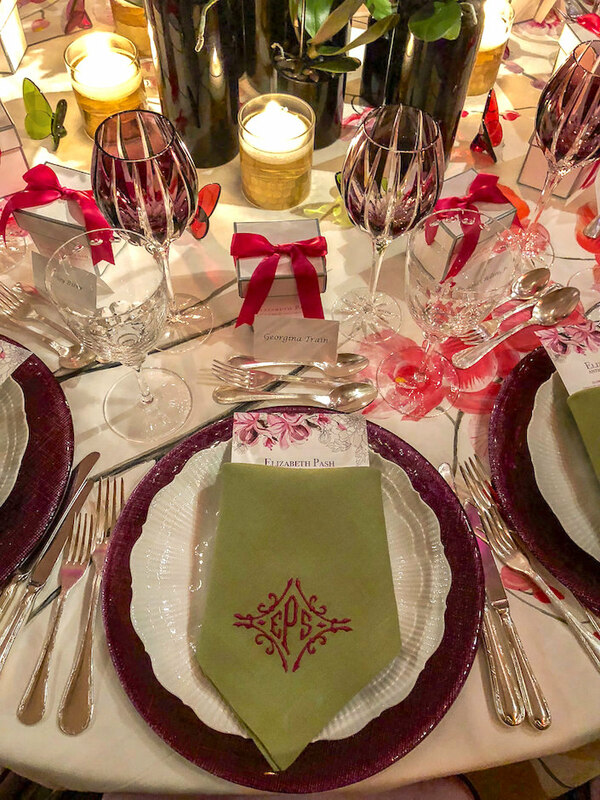 For her lovely table, friend Beth Webb collaborated with Julia B, using her vintage inspired Quattro Mani tabletop collection as well as hand embroidered and hand appliquéd linens. 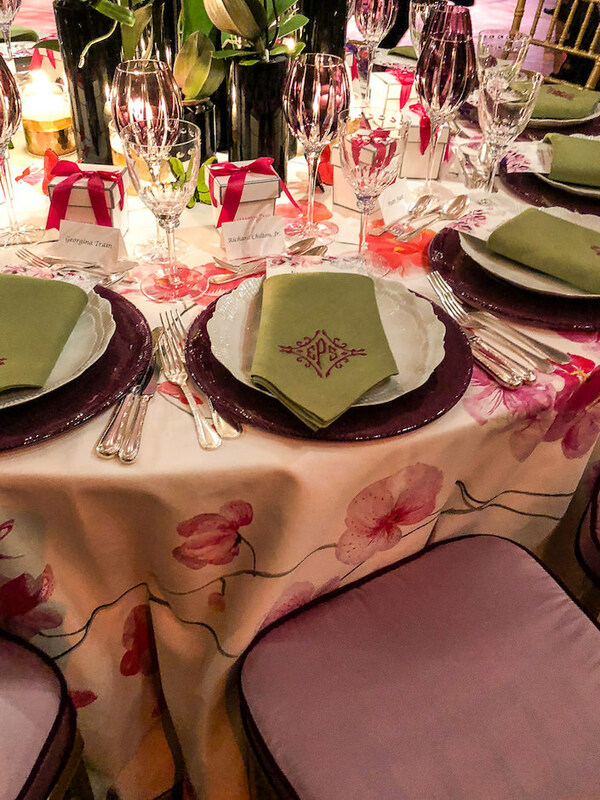 She also partnered with Kravet, celebrating their 100th anniversary this year, for the beautiful embroidered seat cushions in GP & J Baker Willoughby. Colombian woven placemats from Creel and Gow added an additional layer of global chic. 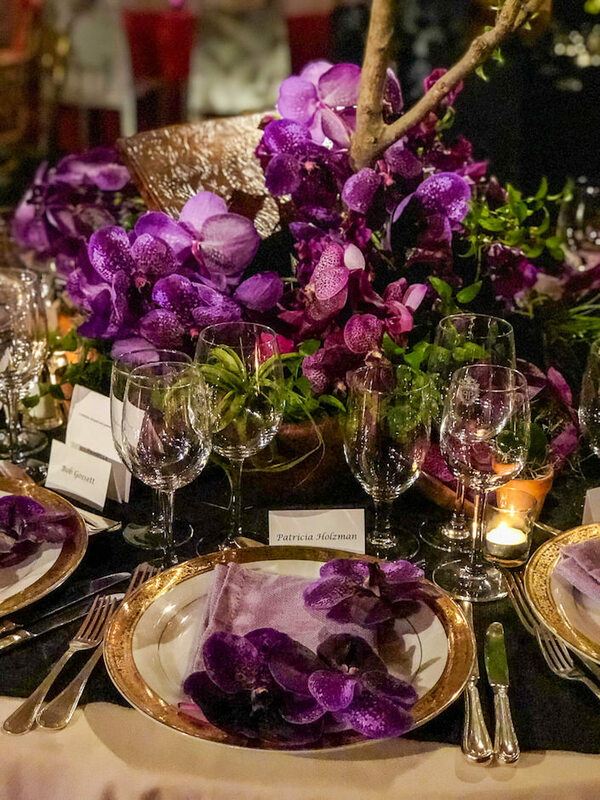 Two years ago, Beth worked with floral designer Zezé on her Orchid Dinner table and reached out to him again, this time with a request to include hydrangeas and sweet peas along with orchids and other exotic blooms to echo the tabletop mix. 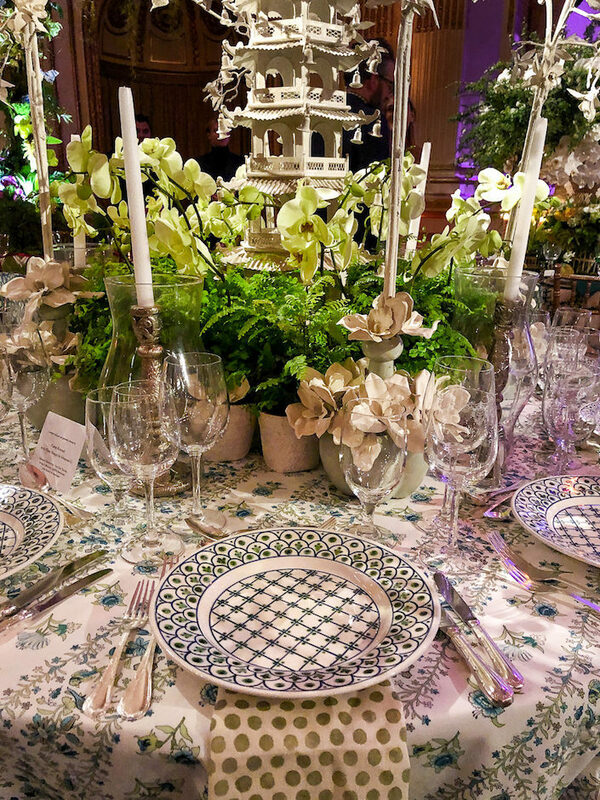 The lush arrangements, top and and below, are in vases from Bungalow Classic. 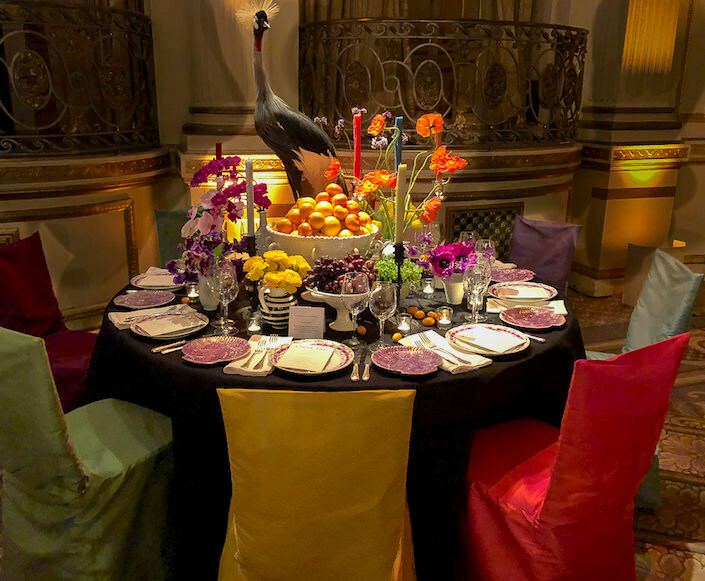 Patrick Mele created his table as somewhat of an “homage to a Dutch still life, albeit through a more saturated pop color lens.” Partnering with Jim Thompson, Patrick used a floor length black silk table cloth and jewel toned chair covers. A variety of overflowering Frances Palmer vessels adorn the table with flowers from Greenwich Orchids. 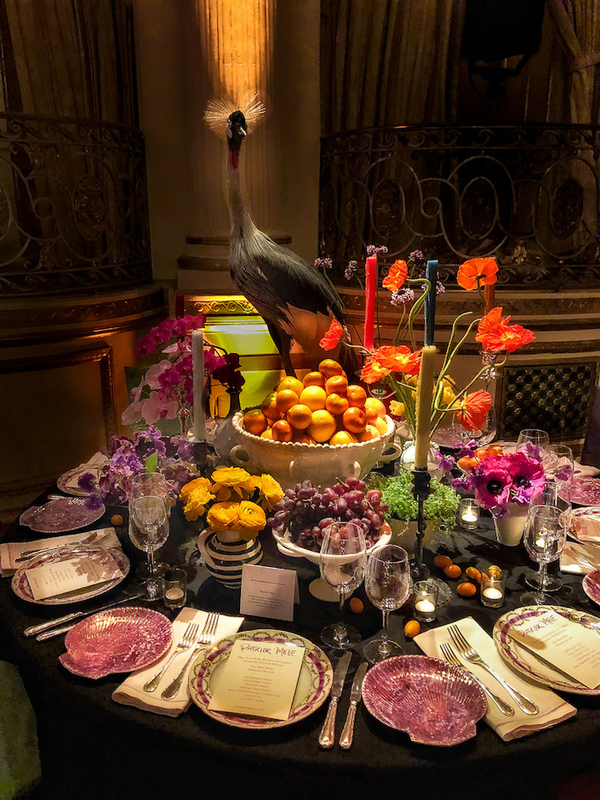 A taxidermy bird from Creel and Gow stood guard over place settings with Betsey Ruprecht Decorative Antiques plates and candelabras (the multi hued beeswax candles available through Patrick’s shop in Greenwich) and napkins with orchid pink hemstitch finish from Deborah Sharpe Linens. 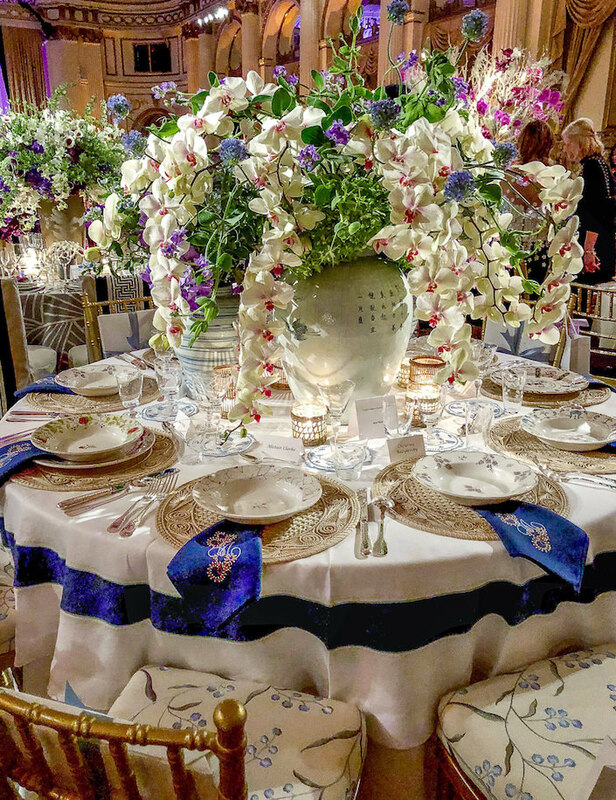 Cathy Kincaid‘s table was like a breath of spring in blue, white and green, anchored by a tall white pagoda surrounded by arrangements of porcelain and fresh orchids by Sebastian Li. and Bunny Williams Home hand blocked notebooks as gifts (on the chair above). Designer Barrie Benson worked with The Style Library for a table featuring her signature modern meets traditional mix. 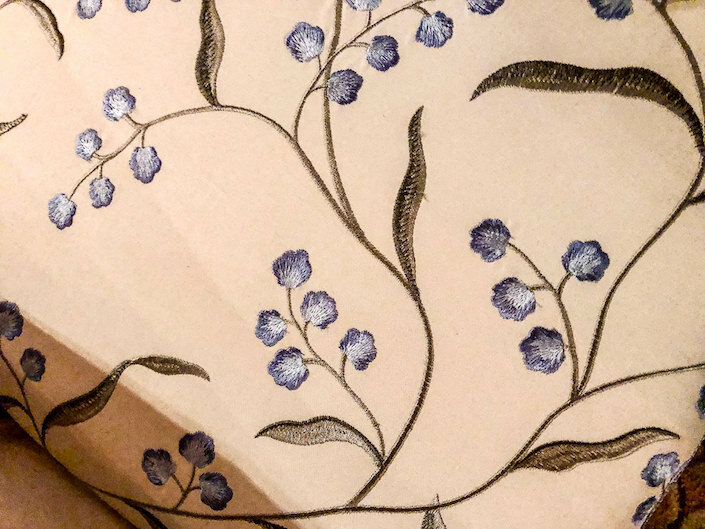 Barrie chose William Morris’ “Pink and Rose” for the tablecloth. With a vintage vibe, it felt fresh with a modern mix of rose and mint. 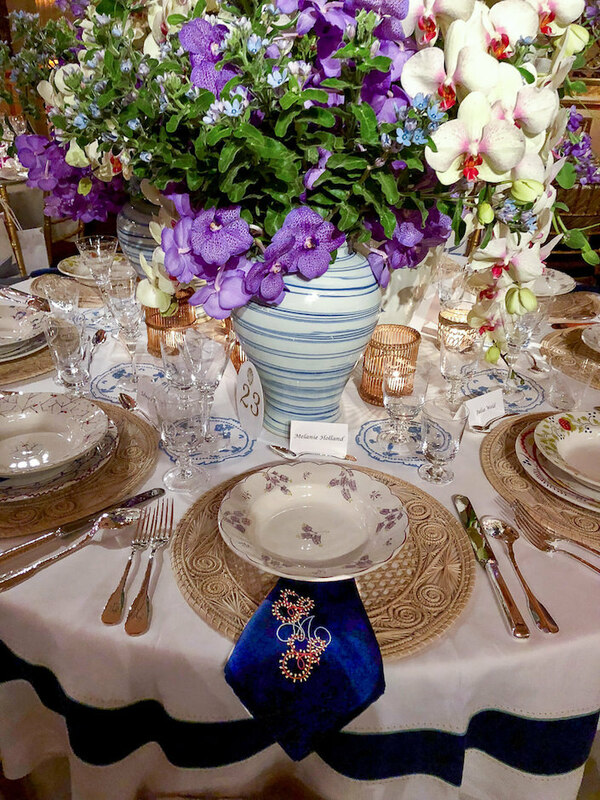 Antiques dealer and decorator Elizabeth Pash was inspired by the large scale orchid themed Designer Guild fabric (distributed through Osborne & Little) she used for her tablecloth. 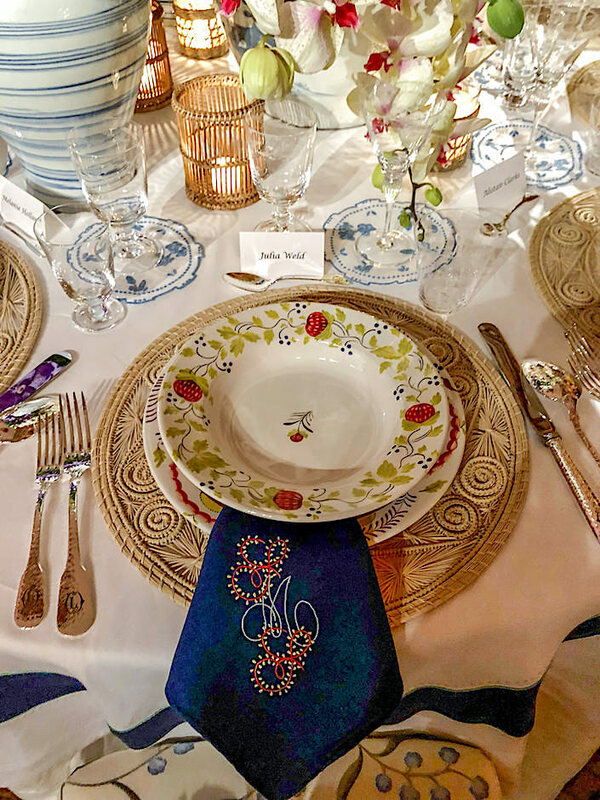 Flowers by Anthony Ortiz, beautiful monogrammed Leontine Linen napkins, William Yeoward crystal (Eliza and Vita Amethyst Goblets), Villeroy & Boch chargers and Elizabeth’s own scalloped vintage Limoges plates added to the spring-like palette. 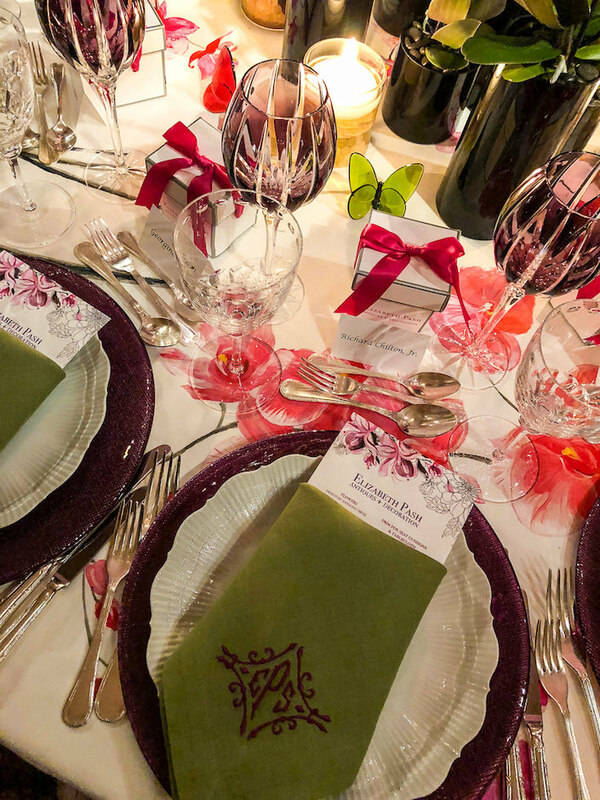 and Baccarat crystal butterflies adorned the table. 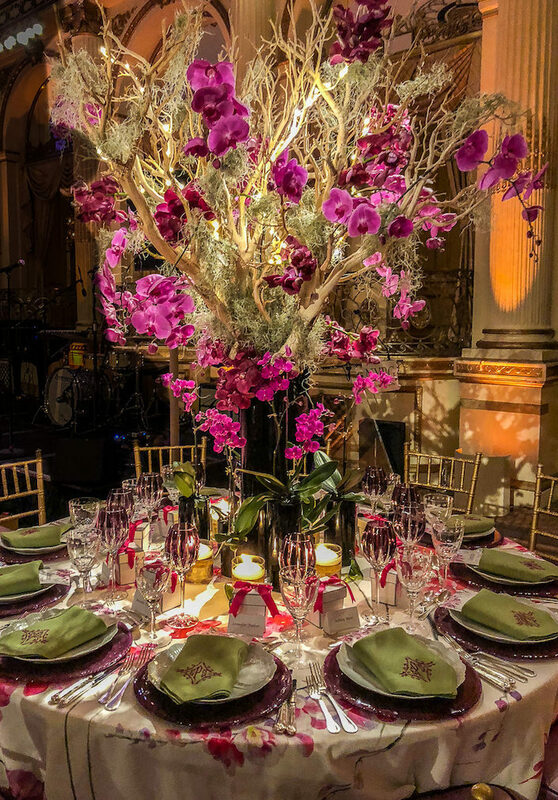 Her gorgeous centerpiece by Zezé was a “sputnik type explosion of orchids, reflective of the exoticism and otherworldly excitement anything rare generates,” around the trunk of which was draped a sinuous necklace hissing with rare luxurious temptation. 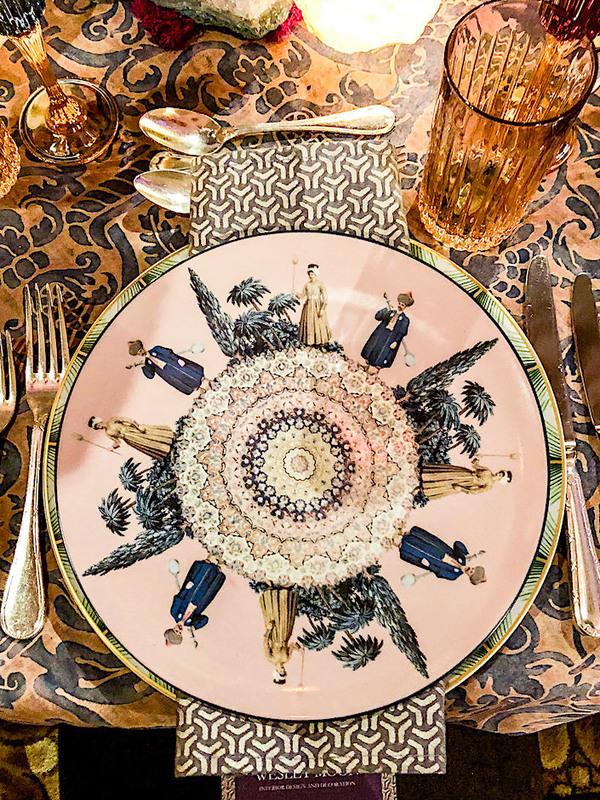 Colette cleverly extended the concept of rare x common to her placesetting. 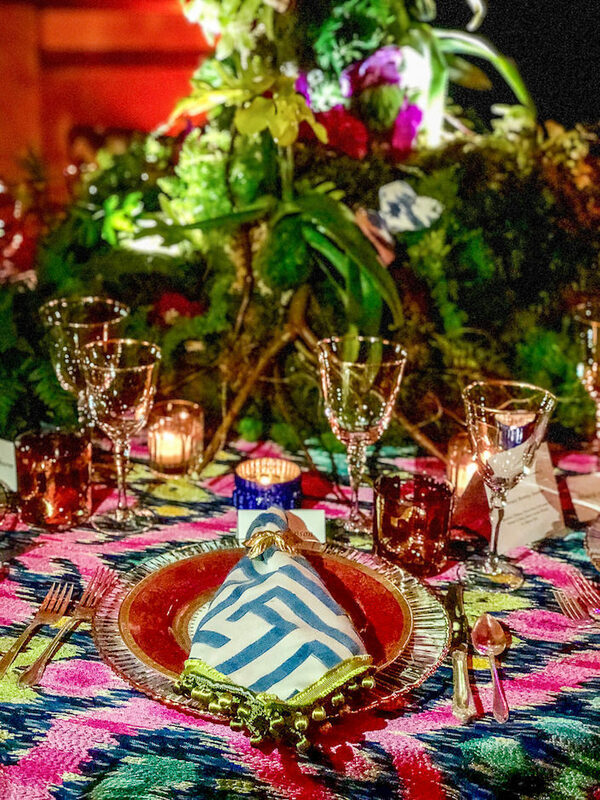 On an ikat tablecloth by sponsor Kravet, she had SugarFlorals create “specimen” sugar paste orchids that gently nestled in the trompe l’oeil palms of Bernardaud‘s “Je te mangerais dans la main” plates by French artists Prune Nourry and JR.
California based designer Ohara Davies-Gaetano found her inspiration in the golden era of opulence, classicism and romance found in the floral still life paintings of the Dutch Golden Age. Flowers by August Sage and Violet echoed the “dramatic cascades of blooms and candleight” captured in those moody still lifes. 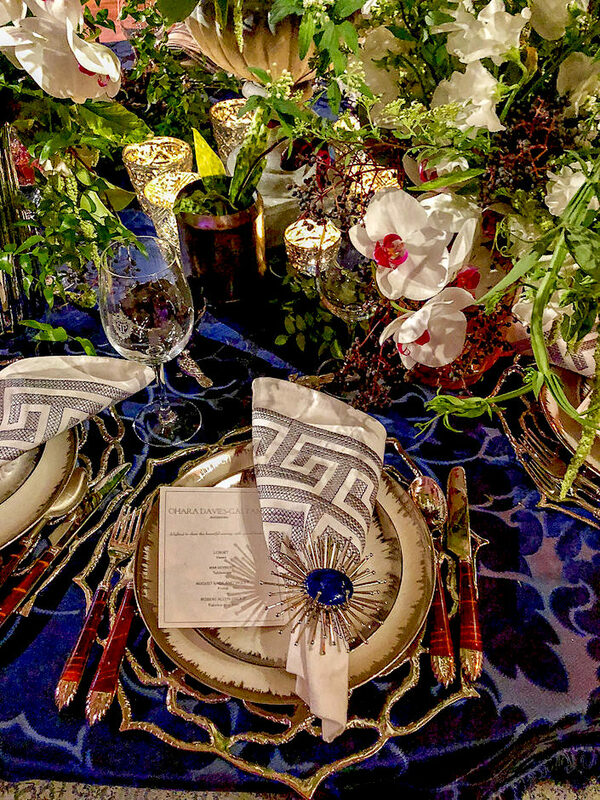 Lush Fabrics and trim from Beacon Hill and Robert Allen, Kim Seybert tableware and vases from L’Objet, completed the tableau. 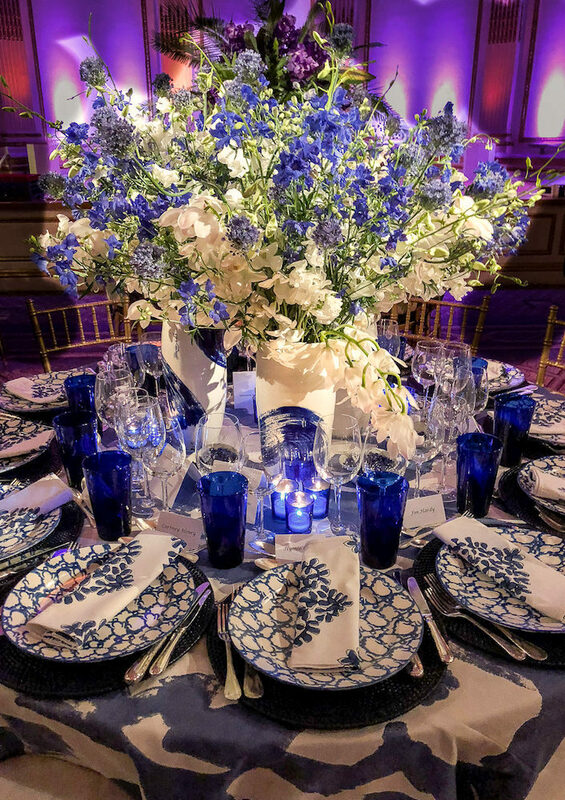 Ford Huniford‘s table was a crisp study in blue and white. 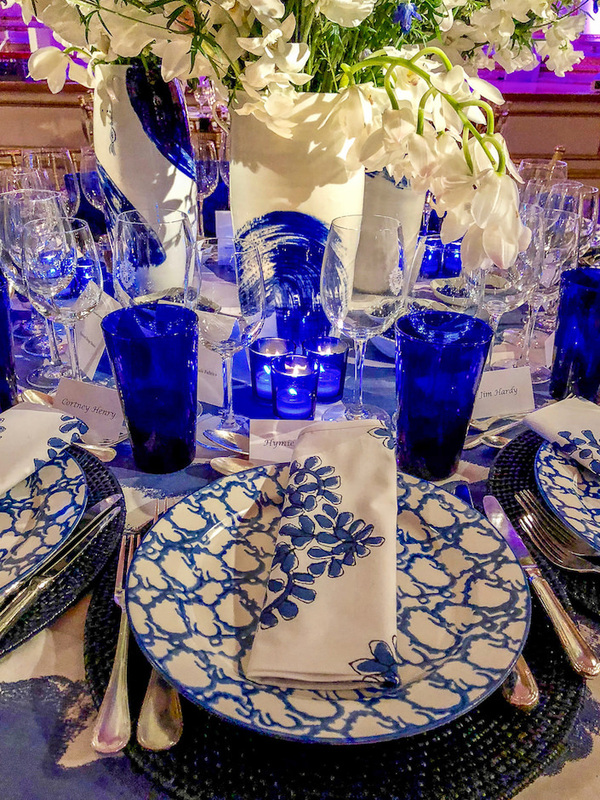 On the bold splashes of a contemporary tablecloth, classic motifs like Tory Burch spongeware plates Madeline Weinrib napkins and a beautiful arrangement by G. Page helped blue and white feel modern and right. 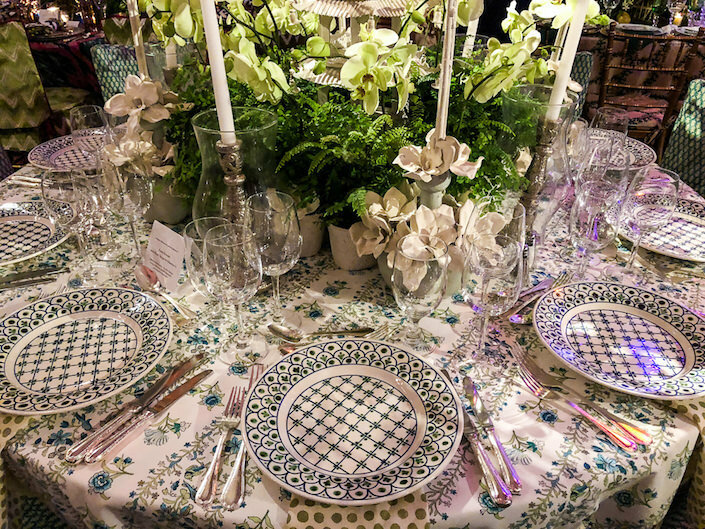 Ford is always inspired by travel and the vases from Tel Aviv and bowls from a recent trip to London added a global aspect to the timeless theme. 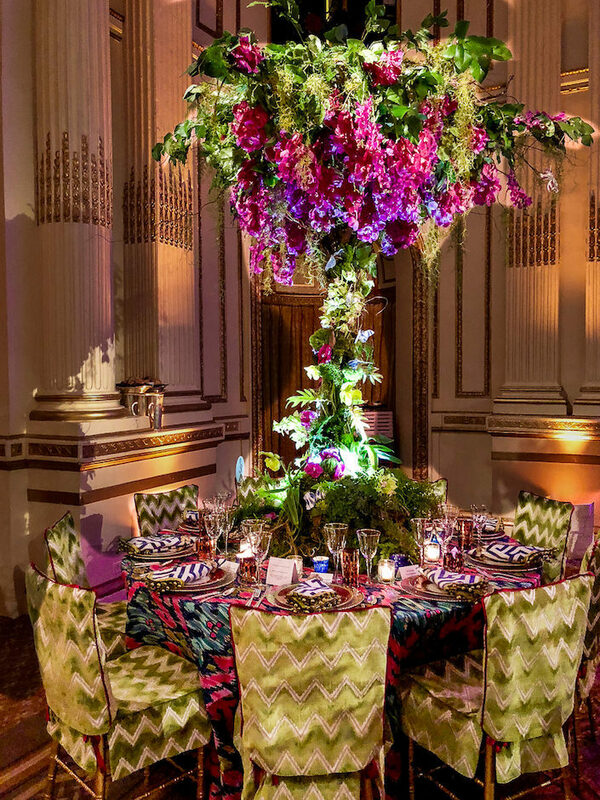 Inspired by the fancifully colored new fabrics from Thibaut, designer Brittany Bromley created an enchanted forest anchored by an enormous moss covered tree blooming with over 350 deep pink orchids, tropical ferns and over 100 butterflies handmade from the Thibaut fabrics..
Pierre Frey‘s jewel toned embroidered ikat Pitaya served as the tablecloth paired with Schumacher’s charteuse Chevron velvet on the chairs, all enhanced with layers of Samuel & Sons passementerie. 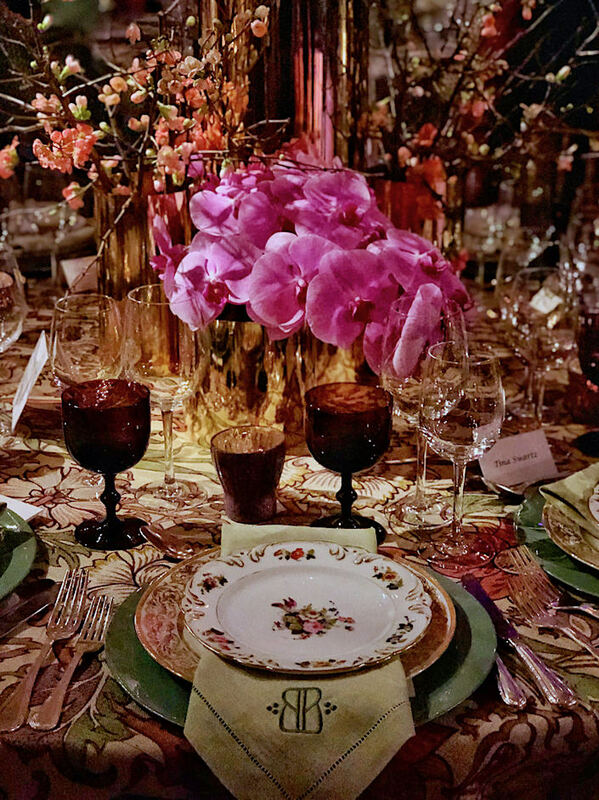 Barbara Westbrook set her scene on a cream velvet tablecloth printed in gold by Coleman Taylor. 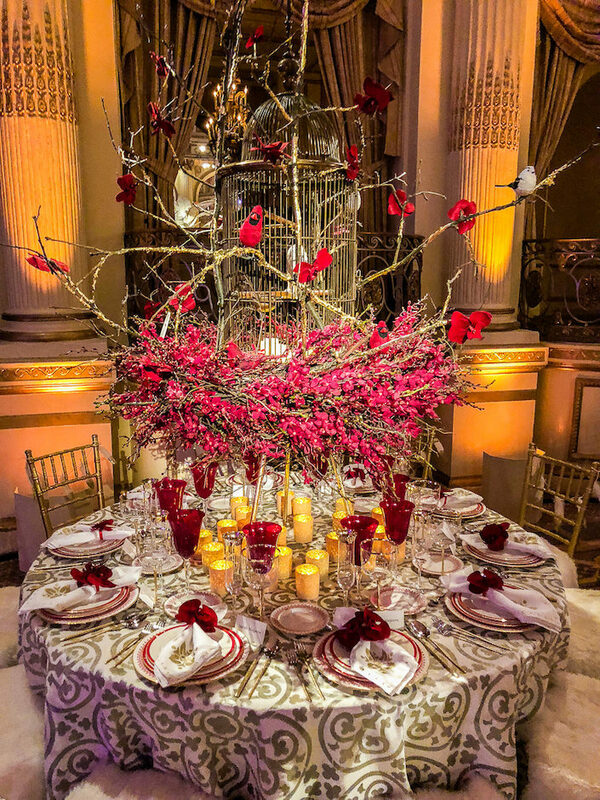 Surrounding an antique bronze birdcage, handmade birds by Abigail Brown perched around a floral arrangement by Sebastian Li. 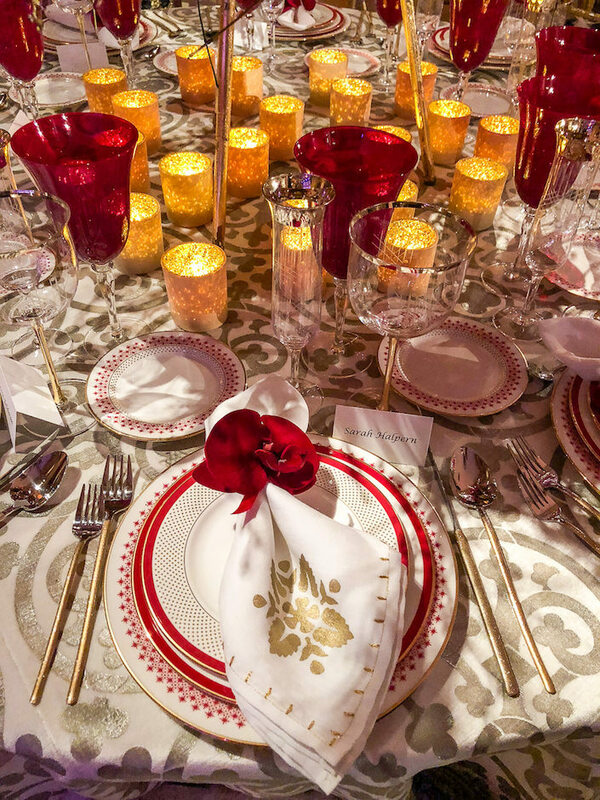 Graphic plates by Kate Spade and votives from Anthropologie continued the festive red and gold theme. 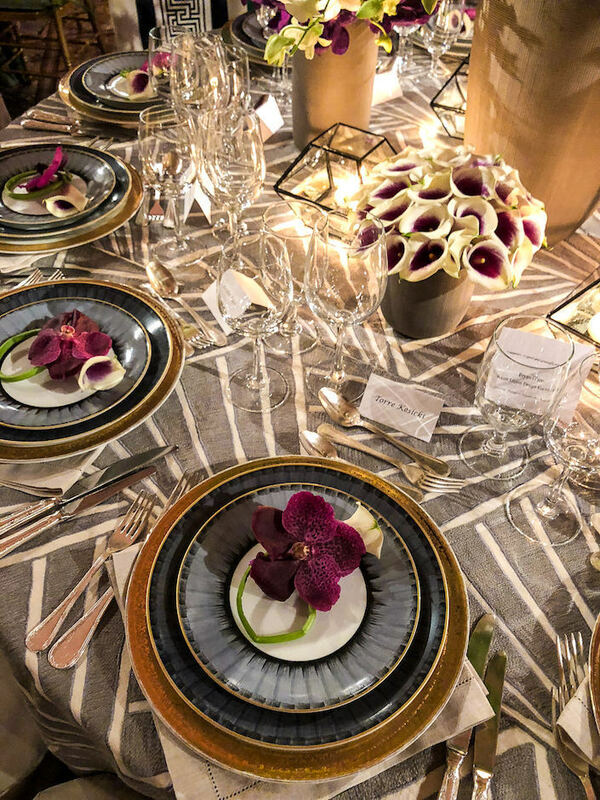 While I unfortunately didn’t get a good shot of the fabulous orchid sculpture l’Olivier created for Wesley Moon‘s table, I was glad I captured the marvelous les-Ottomans plates (sourced through Artemest) that I had just seen at NY Now. 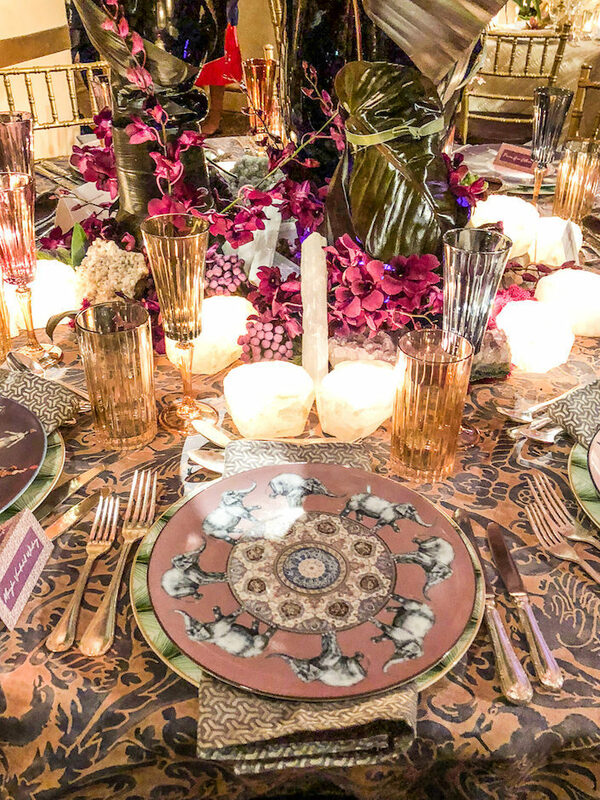 With sumptuous Fortuny textiles for the tablecloth and napkins, the tablescape represented the symbiotic trading relationship of lavish exotic goods between the Venetian and Ottoman empires. 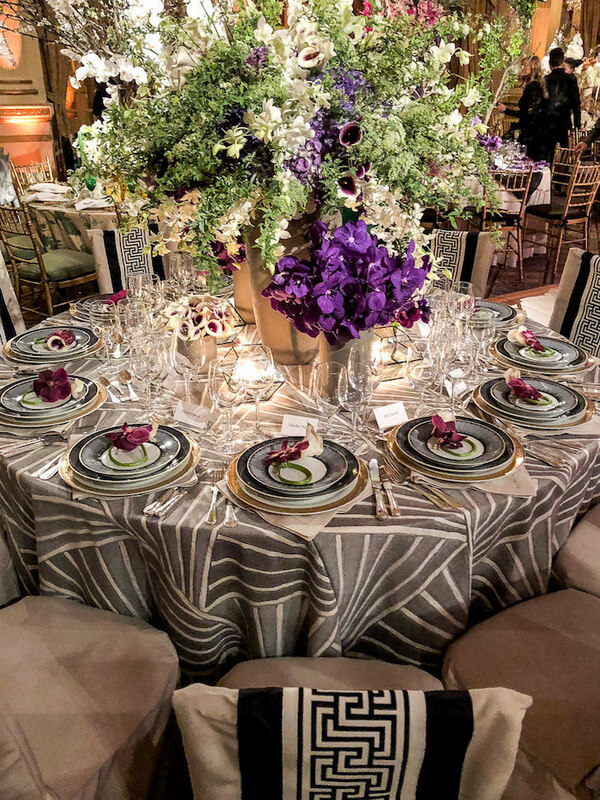 Rubelli fabric with Schumacher’s Labyrinth Tape for the bold and graphic chair covers, Kneen & Co for the beautiful custom Marie Daage dinnerware and Lady Fleur for the centerpiece. 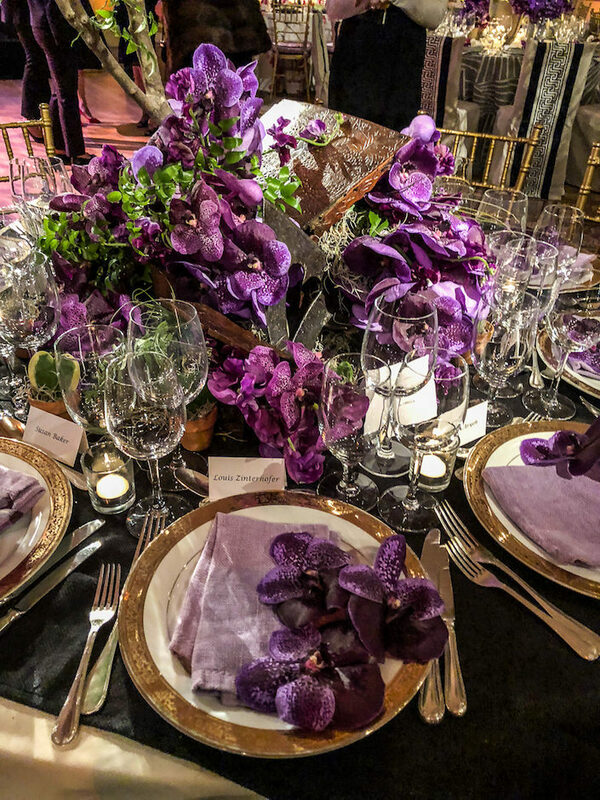 Bella Meyer of Fleurs Bella set an artistic table with amethyst Vanda orchids. 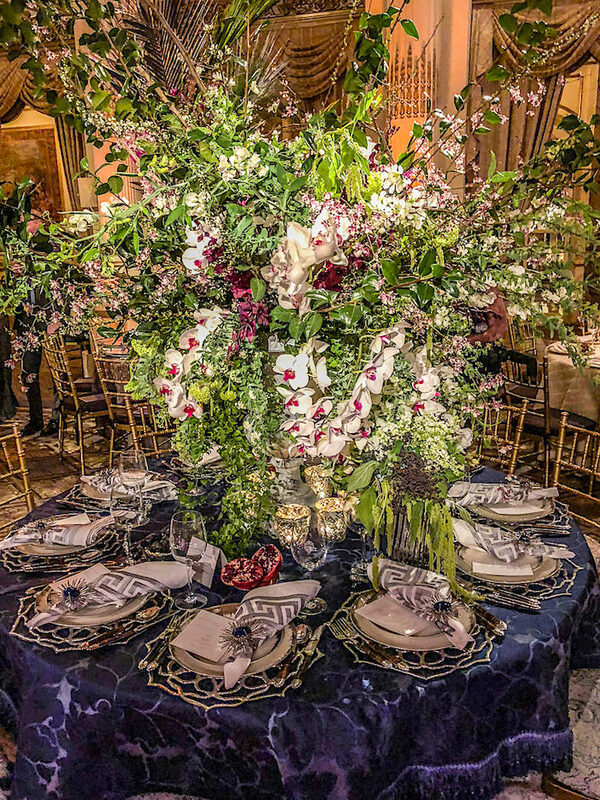 With a profusion of flowers cascading from antique French wedding chests, the table was infused with history and casual French savoir faire. 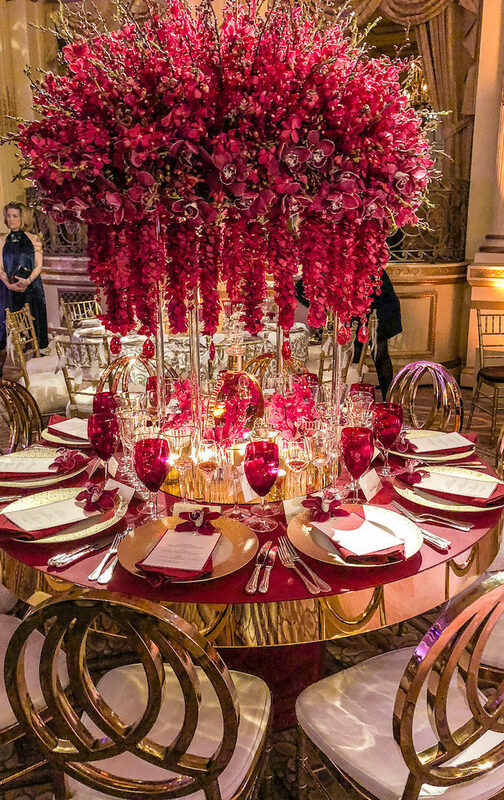 And while I have no details, luxury cognac brand and event sponsor Louis XIII, produced a table befitting their gilded heritage. 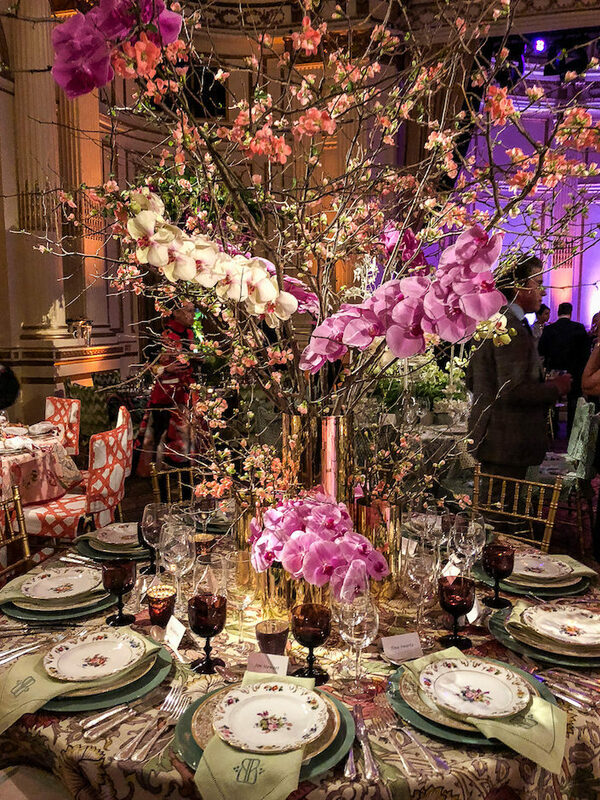 Congratulations to all the designers, generous table sponsors and VERANDA for a most marvelous 2018 NYBG Orchid Dinner benefitting the renowned work the New York Botanical Garden undertakes in their ongoing orchid conservation and research. This entry posted in garden, interior design. 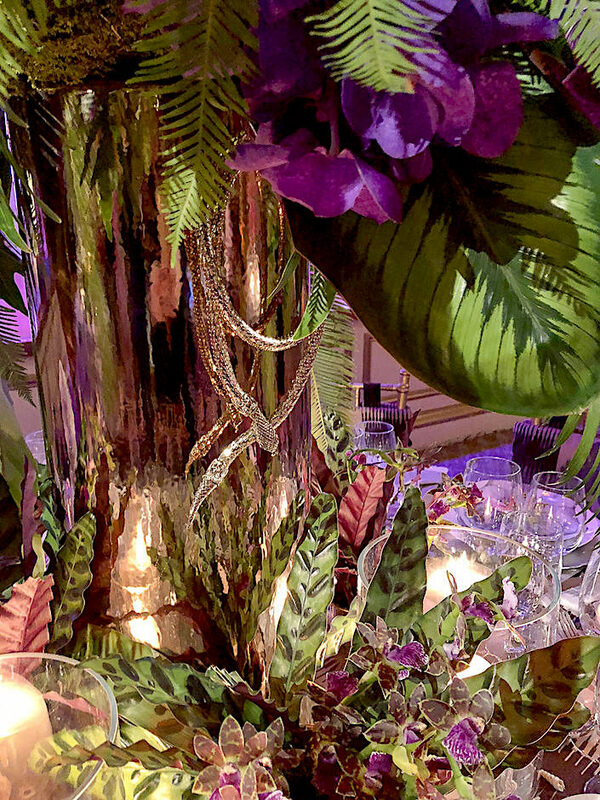 Entry Tags: interior design, NYBG 2018 Orchid Dinner, NYBG Orchid Dinner, Orchid Dinner, Orchids, Tabletop Bookmark the permalink. Oh such lovely arrangements! Some of my favorites: Beth Webb and Cathy Kincaid have their fingers on my pulse. I swear I love everything they touch. I would say that Colette’s table was the most interesting to drool over in this line up. 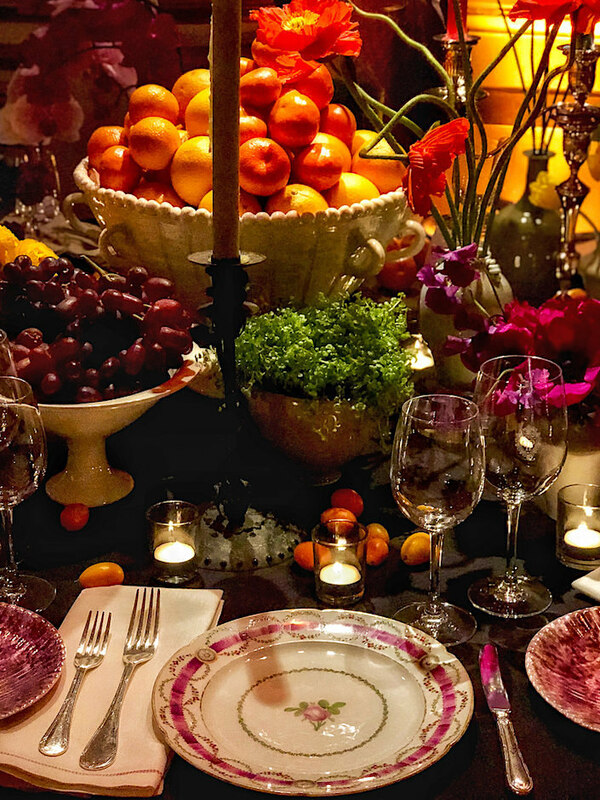 If not in line with personal style, her tablescape is embodies what this event is meant to do, inspire. Had to jump in to say thank you Jackie! Very much appreciate the pre-coffee compliment! xC. Also, Stacy do you know which silverware is used by Ohara Davies-Gaetano? Thanks so much for bringing chic to our lives Stacy! Thank you Jackie! And the flatware is Kim Seybert’s Zebrawood. Thank you for this treat! 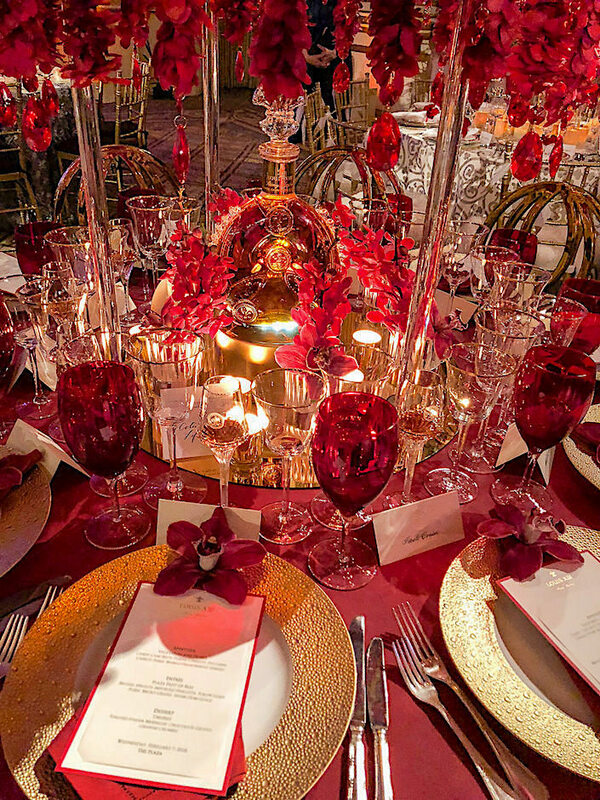 Barbara Westbrook has made me rethink red and white with camels, golds, khakis and creams…. and deeply colored glassware is such an effective element to reinforce a story, especially here with by Ford Huniford….. but , Oh. That. Pagoda!!!!! 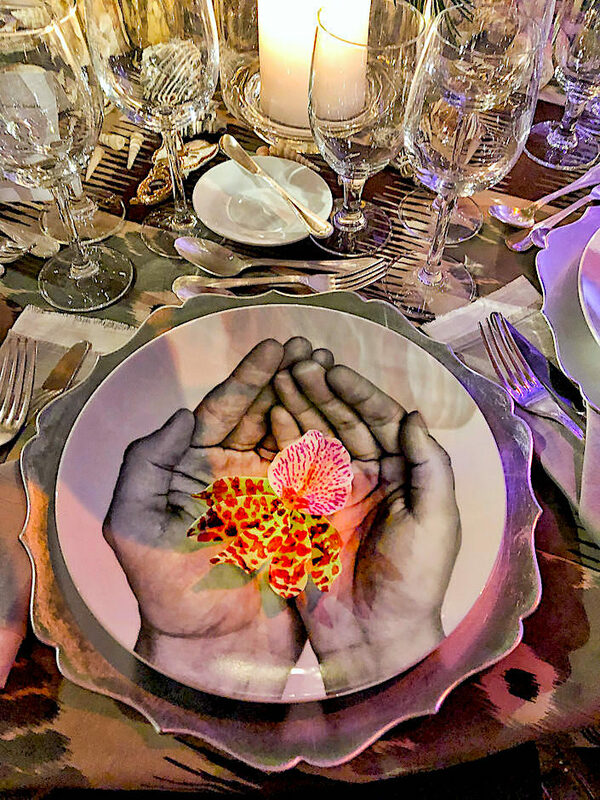 The surreal Bernardaud plates – arresting. When plated with food, they’d offer an interesting provocation. I like! I’m tempted to say the dappled gold plates in the final image are the Ecume Or family, also by Bernardaud. 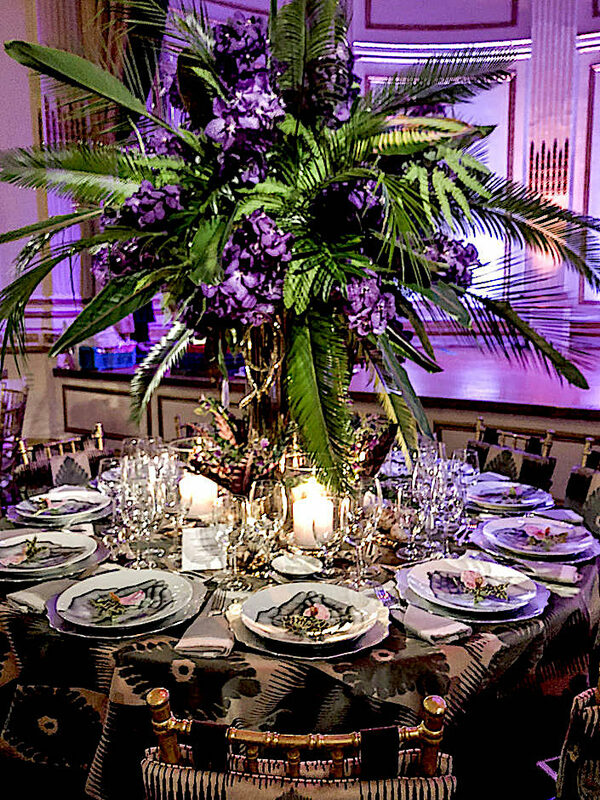 Thank you Stacey for taking the time to provide such detailed descriptions and sources for this incredibly sumptuous event!!! xColette. Breathtaking beauty– thank you for the beautiful images. FB should offer a “Love” link for this vender’s post and a share link too! The most exquisite site that I have ever seen. 82 queries in 0.731 seconds.